Proving we aren’t the only film industry digging up past pop culture successes for filmmaking fodder, this delightful and extremely popular French box office hit is the latest film featuring Jean Bruce’s comical James Bond inspired character which was used in 256 novels and 7 movies after its creation in 1949. Although it’s likely to draw comparisons to Austin Powers, OSS 117 thankfully does not go headfirst into the raunchy toilet humor that the funny, albeit overly juvenile Mike Myers series did. 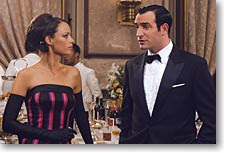 Creative and consistently comical, Jean Dujardin recalls the charm of the bumbling Peter Sellers character Inspector Clouseau in his award winning turn as Hubert Bonisseu de La Bath (aka OSS 117). Shortly after the film begins, Hubert travels to Cairo to monitor the Suez Canal while posing as a poultry farm head to try and make sense out of the country’s nest of spies and above all tackle the idea of creating peace in the middle east, which he figures should not be a problem. Hubert’s “suave self-importance is topped only by his phenomenal ignorance and dumb luck” (Variety) while attempting to carry out his plan. Director Hazanavincius sets up the film’s tongue-in-cheek tone with a hilarious black and white opening sequence set in World War II Berlin. In fact, some of the humor is so fast paced that the film will benefit from a second viewing to fully appreciate the well-constructed and often over-the-top jokes. Although the film will entertain audiences who aren’t versed in foreign affairs, the director noted in his Scottsdale International Film Festival summary that his goal was multi-layered, stating that, “on a superficial level these clichés are the clichés of fifties movies, and at a deeper level, they are the clichés of the controlling western philosophy.” Nominated for numerous Cesar awards in its homeland and earning the Grand Prix at the Tokyo International Film Festival, OSS 117 is filled with cheery, bright and sophisticated humor and memorable performances in a movie that seems to fly by even faster than its ninety-nine minute running time.